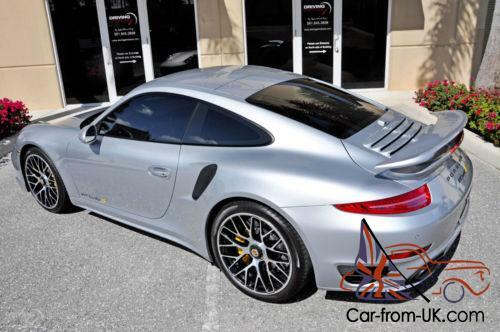 2014 Porsche 911 Turbo S Coupe! Rhodium Silver Metallic with Black Leather Interior! 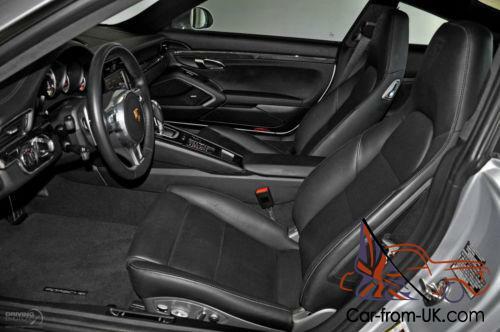 -Porsche Crest on Head Rests! 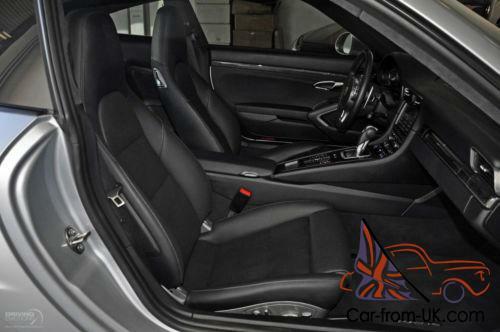 -Power Sport Seats with Memory! 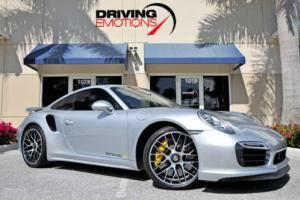 -20 Inch 911 Turbo S Center Lock Wheels! 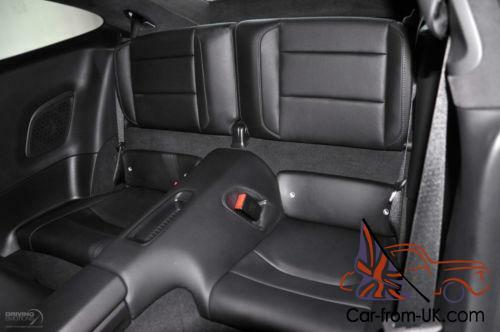 -Ventilated and Heated Front Seats! 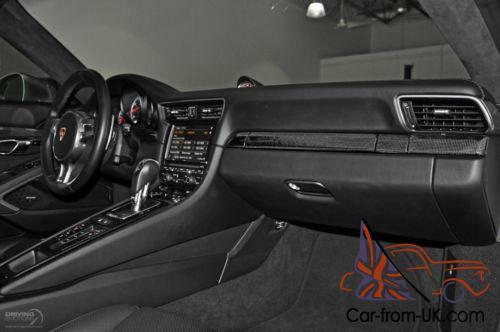 -Porsche Keyless Entry and Drive! -Front and Rear Parking Sensors! 2014 Porsche 911 Turbo S Coupe! Rhodium Silver Metallic with Black Leather Interior!! This car has it all and is the finest example of this model! Extremely Rare Color Combo!! Do NOT Miss This One!! Will NOT Last Long!! Astonishing $189. 25 Original MSRP!! Save Thousands from New!! This stunning vehicle is has only 12. 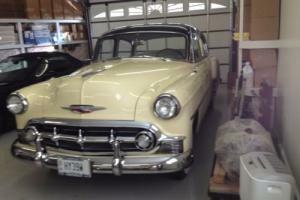 34 Pampered Miles and is kept in an In-Door Showroom! 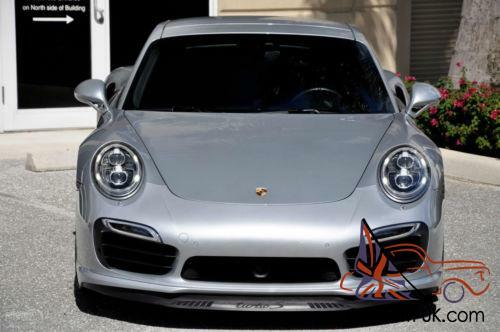 Some of the factory upgrades on this Porsche 991 Turbo S include: PDK Transmission. Homelink. Sport Chrono Package. SiriusXM Satellite Radio Ready (Subscription Required). Porsche Keyless Entry and Drive. Front and Rear Park Assist Sensors. Yellow Brake Calipers. 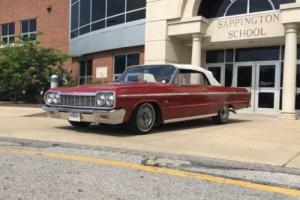 Electric Slide and Tilt Sunroof. Power Steering Plus. Ventilated and Heated Front Seats. 20 Inch 911 Turbo S Centerlock Wheels. Light Design Package. Plus So Much More to List!! 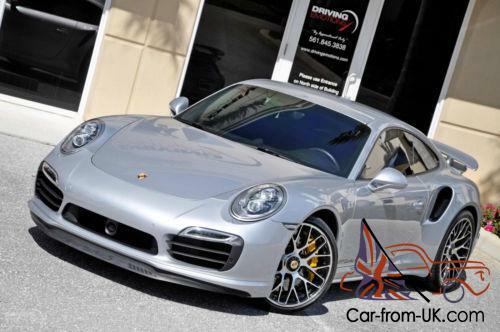 This 2014 Porsche 911 Turbo S is equipped with the following safety features: frontal airbags. door-mounted side protection. and anti-lock brakes (ABS). 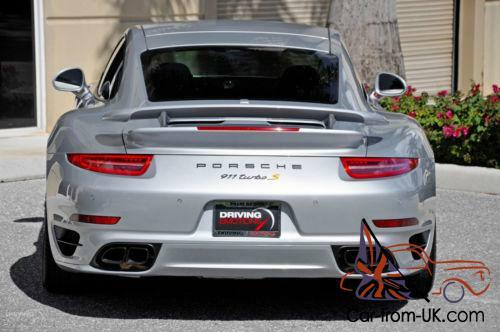 This beautiful vehicle is equipped with Porsche's 7-Speed PDK Transmission. which enables the driver to have superior control. superior performance and superior fun! 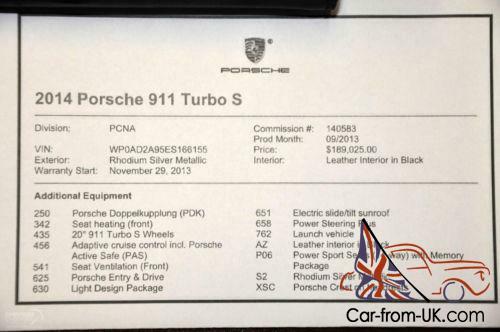 This one-of-a-kind Porsche 991 911 Turbo S has a 3. 8 Liter. Twin-Turbocharged. approximately 560HP Engine and goes 0 to 60 MPH in approximately 3 seconds flat and is capable of approximately 200MPH top-end! 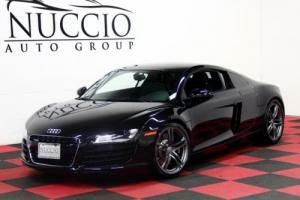 Please contact our experienced Sales Team for more Information on this One of a Kind Exotic! Please feel free to contact our showroom at 561-845-3838. Driving Emotions. We believe that choosing the car of your dreams should be the hard part. not deciding how to pay for it. That's why we offer the Woodside Advantage. Our industry leading collector car finance program offers loan terms up to 12 years. 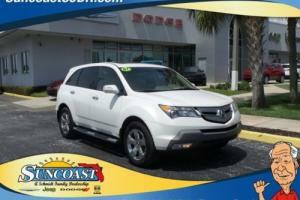 which means you will have the lowest possible monthly payment. We further enhance your experience by offering you pride of ownership with a loan structured as a purchase rather than a lease/rental. It is that simple. You will own the car of your dreams while dramatically improving your cash flow. J. J. BEST BANC & CO. . being the largest Automobile Lender of it's type in the country. is recognized by Antique. Classic. Exotic. Muscle. 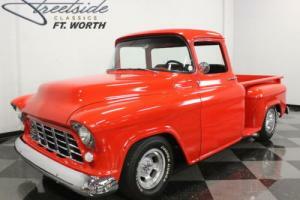 Hot Rod and Sports car enthusiasts and dealers as the leader in the Classic Car automobile finance industry. Offering long terms and low rates. 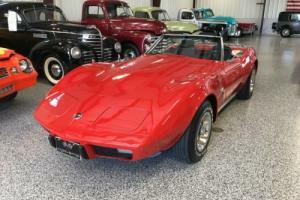 financing is available for most model cars ranging from 1900 to today. At Driving Emotions. we feel there is nothing more important than helping you make the right financial decision when you're shopping for a exotic automobile. Perhaps you demand the best. but like to keep your options open. If so. leasing a exotic vehicle offers the best of both worlds: unparalleled performance paired with a flexible purchase option. 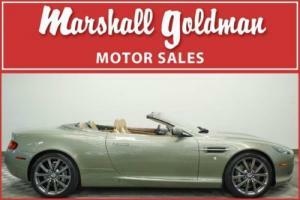 Driving Emotions specializes in high-end luxury and exotic automobiles including Aston-Martin. Bentley. Ferrari. Lamborghini. Mercedes-Benz. Porsche. Rolls-Royce and more. 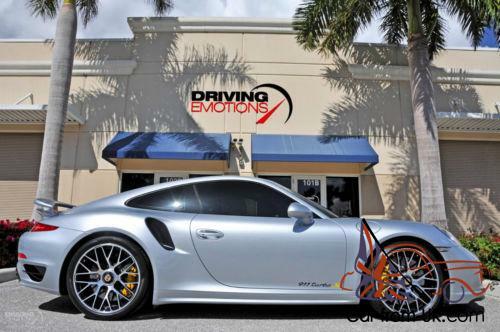 Driving Emotions is dedicated to providing only the finest exotic and luxury automobiles to the enthusiast with discriminating taste. We offer the advantage of browsing for a hi-line vehicle from your home or office and the capability to purchase in total confidence. Driving Emotions is a father and son. 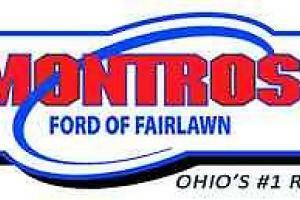 family owned business that is operated with integrity and is dedicated to exceptional customer service and long term relationships with all of our clients. We have earned a trusted and well valued reputation by offering only the highest quality product available on the market. Driving Emotions will surpass your expectations. making this a uniquely gratifying experience that you will want to revisit. Whether you are looking at a exotic automobile or one of our exclusive tuner RENNtech or Carlsson vehicles. you are sure to find something at our facility that will exceed your expectations and unleash YOUR DRIVING EMOTIONS! We look forward to earning your business! Wire Transfers are the only acceptable form of payment. We do NOT accept under any circumstance Cashiers/Bank Checks. Personal/Business Checks. Bank Drafts. etc. Please contact us for details of finance and lease programs available and to apply. Please have all funds available for payment in full within a 3 day period and/or have financing arranged. The vehicle will only be released for delivery and/or shipping upon proof of valid and cleared funds in Driving Emotions account. Feel free to call us for more information. The successful high bidder will submit a $1. 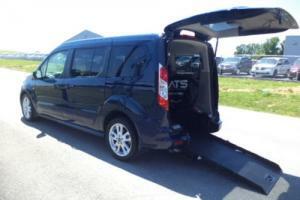 00 non-refundable deposit within 24 hours of the close of the auction to secure the vehicle. All vehicles remain available for sale until full payment or agreed upon deposit is received by Driving Emotions. LLC. When a deposit is received. the vehicle is taken off the market and other buyers may be lost. All deposits are Non-refundable. Please do not place a deposit on any vehicle unless you intend to purchase the car. Deposits are generally only accepted if the seller deems it appropriate for the buyer to have additional time to arrange for funds availability. financing. inspection etc. The buyer agrees to pay remaining balance due (plus applicable fees and taxes) within 3 days of the close of the auction. The buyer agrees to pay remaining balance due including all applicable taxes and fees within 3 days of the purchase date. 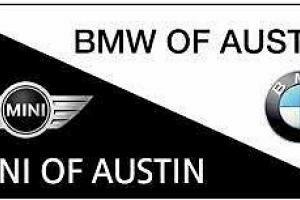 This includes the completion of any finance or lease contracts necessary for Driving Emotions. LLC. 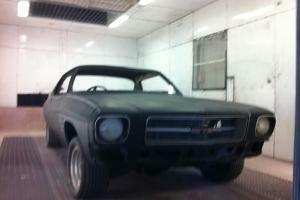 to be funded in full for the vehicle purchase unless agreed upon by an authorized representative. All financial transactions are to be complete and Driving Emotions fully funded before delivery and/or transportation of vehicle. All financial transactions must be completed before delivery of the vehicle. Out of state buyers are responsible for all state. county. city taxes and fees. as well as title/registration fees in the state that the vehicle will be registered. Florida Residents pay Palm Beach County (6. 0%) sales tax on the final sale price of the vehicle. We do charge a $599. 00 documentation fee on each retail sale which includes a temporary tag when applicable. motor vehicle documents and transfers and miscellaneous expenses including clerical fees. notary fees and Federal Express and US mail charges. This fee will not be discounted or waived under any circumstance. Buyers are responsible for all state. county and local taxes and fees as well as any registration and title fees applicable in and required by the state in which the buyer will register and title the vehicle. Buyer is responsible for any expenses. tax and fees should they export the car outside of the US. We may be required to collect sales tax for your state. Please contact dealer for details. The buyer is responsible for all shipping charges. We will assist the buyer with finding a shipping company - call us at (561) 845-3838 for more information. We assume no responsibility for damages incurred after leaving our premises. Driving Emotions. LLC. will NOT handle any arrangements for export outside the US . It is the purchaser's sole responsibility to handle all related details and transport of any vehicle to be exported. Driving Emotions. LLC. can not be held responsible for any delays in shipping as it is beyond our control. If the vehicle is going to be shipped. 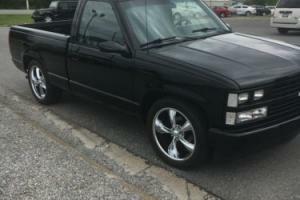 full payment must be received before the vehicle is delivered to the shipping company. 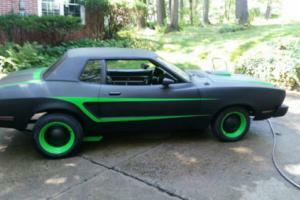 Every effort has been made to accurately and fairly describe this vehicle to you. 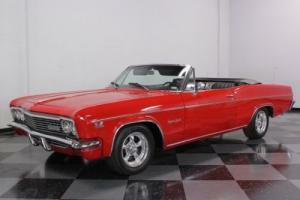 Driving Emotions has tried to disclose all information known about this vehicle for auction. Please be advised that used vehicles will have typical scratches and dings inherent for their year and mechanical parts are subject to fail. Driving Emotions is not responsible for any typographical errors of any kind in the description of this or any advertised vehicle being represented or advertised for sale. Buyers are to expect that NOT all used vehicles will be provided with full sets of keys. books/owners manuals. CD magazines. Navigation Discs. floor mats or the like. NOR will all cars be accompanied by detailed service records etc. Driving Emotions. LLC. will not be held responsible to provide any additional items other than represented as with the car unless detailed in writing by an authorized representative. 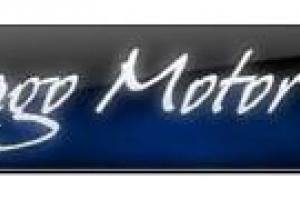 Driving Emotions welcomes and recommends a buyer's inspection. If you plan to have a buyers inspection. please make sure you inspect the vehicle prior to the auction ending. Buyer is responsible for any inspection charges and fees. Unless otherwise stated in the vehicle description. 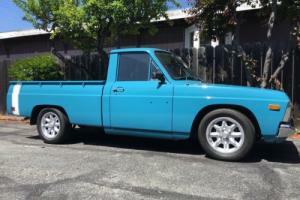 this vehicle is being sold "As-Is. Where-Is". No representations or warranties are made by seller. nor are any representations or warranties relied upon by bidders in making bids. Manufacturer's warranties may still apply. Extended warranties may be available; please contact us for details.